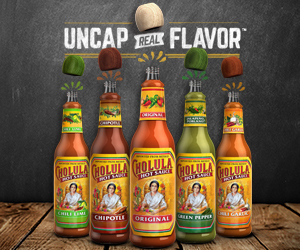 This is a good traditional hot sauce. It definitely has a medium spice level. It’s not too spicy, but after it’s cooked, you can taste the kick even more. The sauce is red in color and has a runny, thin texture, so be sure to shake before using. The heat comes from the red peppers, but it’s nothing too intense at all. The sauce has very few ingredients, so there isn’t too much depth of flavor, just pepper and vinegar. Overall, it’s a delicious traditional sauce with medium heat, perfect for a Bloody Mary. This sauce smells like pepper and vinegar. It has a medium spice level. This sauce is good, with a medium spice level. It’s that traditional tabasco sauce that brings a kick to almost anything. The main flavor is vinegar and peppers, so it’s very simple, yet the perfect addition to so many recipes. 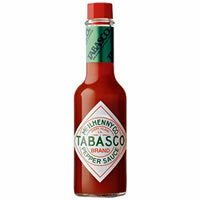 Tabasco Pepper Hot Sauce has a very small number of ingredients- Red Peppers, Vinegar, and Salt. This mix of ingredients really creates a simple but tasty sauce you can use to spice up almost anything. When I added it to chicken and allowed it to cook a bit, the sauce developed a little more of the spice and vinegar taste. The sauce definitely seemed stronger after it had been warmed up. Luckily, no matter how hot, cold, fresh, or cooked, tabasco sauce always has that traditional and memorable flavor. The 2 oz bottle costs $1.96. That’s a very affordable hot sauce!